Julian Voloj is one of the exhibit organizers. Every year thousands of Americans visit Europe, searching for remnants of a once-thriving Jewish culture. Countries such as Poland and the Czech Republic, though their Jewish communities have nearly vanished, have become places of pilgrimage for Jewish heritage tourists. In the United States, however, while Jewish culture thrives American Jewish heritage is usually forgotten. As a European Jew I am searching for Jewish heritage in metropolitan areas in North America. After a first series focusing on New York, I am now revisiting inner-city Detroit’s former Jewish neighborhoods. In the 1940s Detroit was home to a vibrant Jewish community with over 80,000 members with dozens of synagogues. Today, Detroit has only a few hundred Jews and one remaining synagogue. 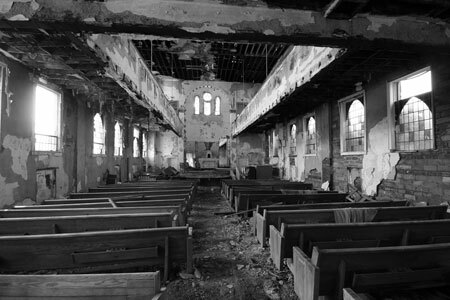 Detroit is often associated with urban decay, and some of the worst areas can be found north of Grand Boulevard. In 1967 this was the epicenter of the riots, but over a decade earlier the area was home to the Jewish community with dozens of synagogues along Linwood Avenue. Today, many of these buildings are abandoned. Others, among them two beautiful houses of worship erected by world-renowned architect Albert Kahn, have been reinvented as churches. These explorations are not just journeys into Detroit’s Jewish past but into various layers of history. The Jewish community is a microcosm of the city’s history and stands as a symbol for the city as a whole, rediscovering Detroit’s Jewish heritage and examining Americans' approach to their own heritage. 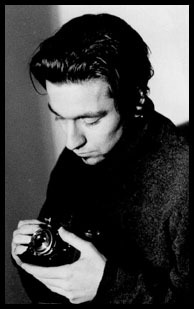 The German-born photographer and writer Julian Voloj explores Jewish identity and heritage in his work. His award-winning photographs have been published in a variety of newspapers and magazines including the Forward, Jerusalem Post, Tablet Magazine and Washington Post. He lives with his Detroit-born wife and two sons in New York City.